After a few years of record sales, business optimism about the future of Hawaii's economy is waning -- falling to its lowest level since 2003. A new survey focusing on retailers shows that less than a third of the more than 400 companies polled feel the economy will improve this year. The Business Banking Council survey released yesterday showed that increases in the cost of doing business, the tight labor market and a drop in Eastbound visitors are the main factors slowing down the economy. Retailers are scrambling to attract and retain workers and diversify their offerings to meet the needs of visitors and residents alike. Employers are trying to deal with the scarcity of workers by promoting from within and increasing incentives to reduce turnover. Optimism among businesses that Hawaii's economy will improve in the coming year is at its lowest point since 2003, according to a recent poll of more than 400 local companies. A Business Banking Council survey released yesterday shows that less than a third of the companies polled, or 29 percent -- compared to 43 percent a year ago -- believe the state's economy will improve this year, while 54 percent expect little or no change. Increases in the cost of doing business ranked highest among reasons that might bring about an economic downturn, followed by the tight labor market. Twenty-seven percent of businesses have increased staffing levels over the past year, while 52 percent report increases in gross revenue and 46 percent have seen an increase in profit before taxes. Meanwhile, more than half of the businesses surveyed continue to promote from within and nearly half have increased incentives to reduce turnover in Hawaii's record low unemployment market. "Our economy has pretty much leveled off, and we're not going to see that phenomenal growth," said Carol Pregill, president of Retail Merchants of Hawaii, which has 200 members statewide. "At this point there are other forces, particularly the low unemployment rate, that really is going to inhibit any kind of substantial growth going forward." Desperate businesses are poaching each other's employees, offering better benefits and salary packages, way above the minimum wage of $7.25 an hour, Pregill said. To deal with the scarcity of workers, the organization has started to work with community colleges and vocational schools to attract students to the retail industry. "Most of our members are participating in job fairs and visiting schools, but competition is fierce because everybody else is," she said. While optimism was higher among retailers than the overall businesses polled, the number of customers and average amount being spent in retail has dropped from a year ago. Meanwhile, retailers who rely on tourists estimate that only 19.2 percent of their customers are eastbound visitors, a significant drop from 37.9 percent a year ago and the lowest proportion since 2004. "The greatest concern is the (drop in) the Japanese market," said Susan Todani, Kamehameha Schools' director of special projects, including the Royal Hawaiian Shopping Center. Todani said Kamehameha is trying to diversify its customer base at the Royal Hawaiian Shopping Center and expand offerings to attract more of the westbound market and local residents with entertainment and midpriced restaurants. "The Royal Hawaiian used to be predominantly Japanese oriented with high-end retailers, but we've made a conscious effort to not put all our eggs in one basket," she said. The survey, sponsored by American Savings Bank, was conducted from February 2006 to February 2007 by QMark Research & Polling, which interviewed 403 businesses, including a subset of 116 retailers. 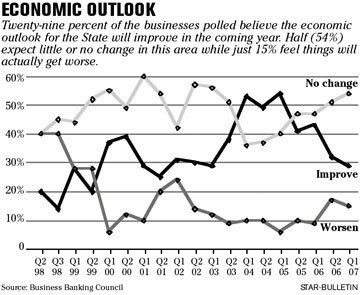 The survey's optimism factor index -- which tracks the general outlook of businesses for Hawaii's economy -- is 119, unchanged from the second quarter of 2006, but its lowest point since 2002 when it was 114. Meanwhile, the performance factor index -- which tracks changes in employment, gross revenue and profit before taxes -- has fallen to 124 this quarter, compared to 131 in the second quarter of 2006. "Things overall do look good, but there are little pockets of problems like the eastbound customers being down and the concern of how far we can sustain this boom," Pregill said. "There's no way you can continue to see these huge increases in business growth, particularly when you have nobody to work."